Hanoi (VNA) – The number of new dengue fever cases in Hanoi has dropped in the recent two weeks but is still high, heard a meeting of the Steering Committee on Epidemics Prevention and Control in Hanoi on August 25. A report from the Department of Preventive Medicine under the Ministry of Health showed that Hanoi tops the list of 10 localities with highest dengue fever cases nationwide. The municipal Department of Health reported 19,962 dengue fever cases with seven deaths from January 1 to August 22. The virus was found in all 30 districts and wards, mostly in inner city. 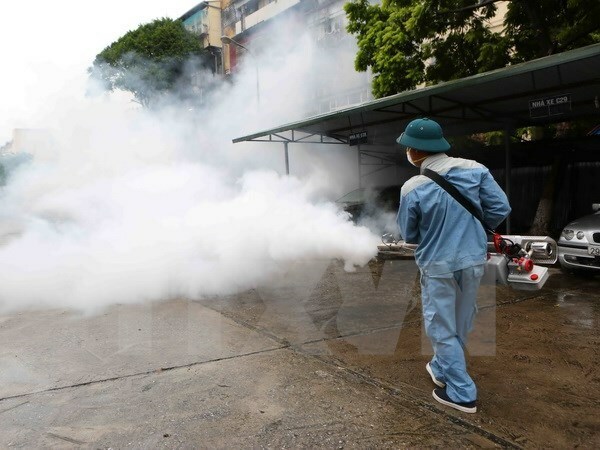 Hanoi has conducted large-scale spraying of anti-mosquito chemicals, while promptly tackling small and newly-detected outbreaks. Head of the Department of Preventive Medicine Tran Dac Phu said that in the coming time, the health sector will focus on killing mosquitoes in outskirt localities and adjacent provinces. Since early this year, as many as 100,417 dengue fever cases have been reported nationwide, a rise of 47.9 percent year on year, with 26 deaths, 9 more than the same period last year. The southern region accounted for 52.7 percent of dengue patients, northern region had 29.1 percent, and the central region 14.9 percent. Hanoi and Ho Chi Minh City are the two leading localities with highest cases and deaths. Deputy Health Minister Nguyen Thanh Long asked Hanoi and other localities to roll out stronger measures to suppress dengue virus on the threshold of the new academic year.